Dark Warriors Blog » Blog Archive » Are you thirsty? 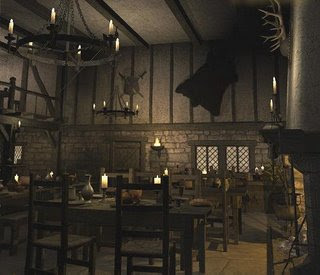 Why not stop by the Tavern to have a nice glass of beer? Everytime a warrior pass by the center of the Village, they stop by in that old looking Tavern wandering what they will find inside. You decide to come inside and since you are a new face everyone starts to stare at you while drinking some Beer and eating some fried chicken and you don’t know what to do or say as you enter in the dusty bar. You decide to take one of the sits in front of the Barkeeper, Edulahin is his name, a friendly looking taverner that serves the best Beer around. He’s one of the famous characters in the Village and he is known by the travelers for its tasteful drinks and good music that plays in his tavern by a group of local bards. He tell’s you the legend of the mighty knights that already joined his Tavern and points to a big dragon head hanged in the wall, it was a gift of one of the most famous warriors that crossed his way. You watch some drunk warriors dancing with the warriors ladies and others playing darts with their friends. There are also a couple of dark looking men in a dark corner and you decide to stop looking at them to avoid trouble. As a newcomer to the site you’re a good observer and picks the best group to join, you grab your dark Ale and joins the group of people dancing trying to make friends. The day pass by and you didn’t notice, it’s already dark and now it’s time to find a place to sleep without getting killed!! The Local Tavern is the best place to go when you are bored, there’s no end for the fun inside it’s walls! This entry was posted on Tuesday, November 23rd, 2010 at 17:07	and is filed under Hooligans Hideout. You can follow any responses to this entry through the RSS 2.0 feed. You can leave a response, or trackback from your own site. I have to try one of these drinks.